It’s fair to say that I like to get outdoors. Although I’m not a frequent or avid camper, now that the kids are sort of old enough, I think it’s important we all get out and get some outdoors and tent time in. We first went together in 2012, but for a pile of reasons we missed last year, and so this year we’re trying to make up the trip count. 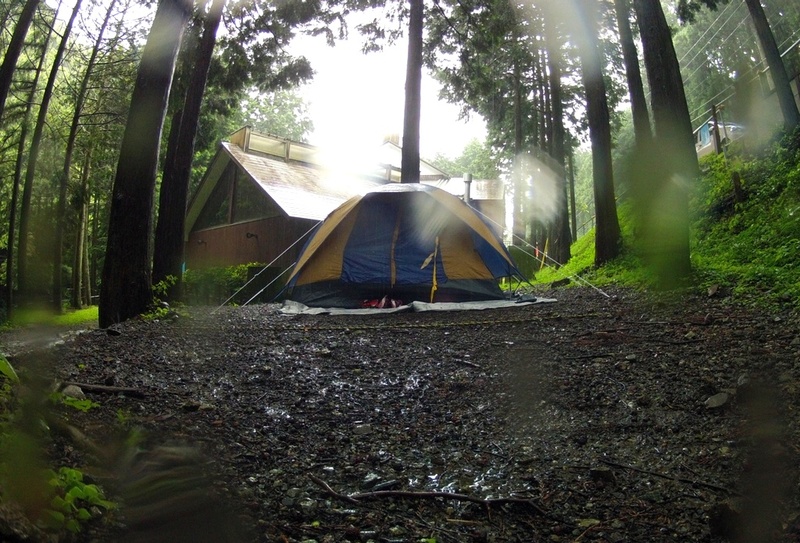 June is part of Japan’s rainy season, but undaunted I booked a spot at a place I hadn’t camped at before up in the mountains, near a river,called Yamagoya. It’s only a bit over an hour from the house, so I thought that if it turned into a complete disaster I’d just have to up sticks and it would be a short drive back. As the date came up, it was clear it would rain at some point. On the day we drove up it was raining, and when we arrived, I expected the kids to complain, but actually they loved it, and I have to say, they didn’t complain once during the whole weekend. The site is small, running about 100m along a small river bank. Come the real summer they’re mainly set up with family sized BBQ sites, but right now they just had a few tarps up covering about half of them. They actually only have 3 designated tent pitches. This was the first odd point – the pitches were away from the river, and broadly flat, but they’d put several layers of stones there, which may have helped run-off and drainage, but made getting the tent pegs in quite a bit harder, and of course the rain makes everything more slippery. Like the previous camp though, I set up my GoPro on time lapse, and afterwards made a video from it – the kids love watching the tent go up at high speed! The stones could have been a bigger issue, had I not brought our Thermarests, of which I’ve become a bit of a fan over the last few years, meaning for the kids especially, they could get comfy in their sleeping bags on one of these mattresses, and get some sleep. Once the tent was up we went in to the adjoining cafe for some lunch. They only have a small menu, very Japanese oriented, which is fine, but not much for the kids. That said, the tofu salad and udon we ordered was excellent, and we could divide it between the three of us. They also do desserts and kakigouri (shaved ice with some fruit cordial), which obviously did go down well with the kids. It wasn’t expensive, given they’re serving a relatively captive audience, but marginally more expensive than a family restaurant. As the rain came down gently, it was actually quite picturesque, looking down the river, and off a slight cliff down the valley. The kids were happy with my decision that since they were wet anyway, paddling into the river a little wasn’t going to do any more damage, so we passed quite a bit of time just exploring the riverbank and the site. One of the best things about camping is cooking outside though, and it’s something my kids like too. For normal meals at home they can sometimes be picky, but when it comes off a BBQ or the camping stoves, there are no arguments. The drizzle had let up a little, so I broke out our two stoves – one is my normal lightweight backpacker stove, the other is a domestic ‘cassette gas’ burner. I found one of the set out tarps which was anchored quite high up, and set up just below and to one side of it – you don’t want to be melting or setting fire to tarps – so we got some rain shelter and played safe. I do like cooking outdoors, and with two stoves, got some spaghetti bolognese going. One thing I was glad I brought is my Gerber multi-tool – I somehow bent one of the guide lips on my camping stove, and had to gently bend it back into shape with my pliers. There wasn’t any showers that I noticed, but the toilets were clean enough for a camp site, and part of a concrete building, so the kids weren’t too fussed about it. It’s still odd to me that the same kids who complain about a small mosquito at home, don’t seem bothered by much bigger insects when they’re camping. Let’s talk about insects. I don’t really have a problem with insects when I’m outdoors, with the possible exception of the midges in Scotland. Insects live outside, it’s what they do. However, twice over the weekend, I must have looked like a tempting and tasty target to Yamaburi, which are Japanese mountain leeches, and I had to remove them both forcefully, but safely (well, safe for me, not so much for them). They’re hardy things I can tell you. I should probably discuss something about the staff at the site too. They’re very nice and polite, but a little slow, and aren’t entirely intuitive. I noticed this when I booked the site as I booked over a week ahead, confirming everything down to kids ages, arrival and departure times. When my wife called a few days before to check on things (if they rented towels etc.) she got into a weird conversation that the booking was somehow not complete. Finally she got confirmation that actually it was all booked. We still don’t know what the story was there. If it wasn’t complete, why hadn’t they called the mobile number I’d provided. I wonder if they’re the off-peak part timers? All in all then, a good, simple one night camp. I think we’ll go back later in the year, and take advantage of one of the BBQ spots, as well as the tent pitches, as that would be fun. All that remains is for me to find out how to dissuade the local leeches, or a better way to remove them (if you have any ideas, please add to the comments).